For the architecture firm, see TERROIR. The steep slope, soil quality, and influence of the nearby Mosel river distinguish the terroir of this German wine region. Terroir (French pronunciation: ​[tɛʁwaʁ] from terre, "land") is the set of all environmental factors that affect a crop's phenotype, including unique environment contexts, farming practices and a crop's specific growth habitat. Collectively, these contextual characteristics are said to have a character; terroir also refers to this character. Some artisanal crops for which terroir is studied include wine, coffee, tobacco, chocolate, chili peppers, hops, agave (for making tequila and mezcal), tomatoes, heritage wheat, maple syrup, tea, and cannabis. Terroir is the basis of the French wine appellation d'origine contrôlée (AOC) system, which is a model for wine appellation and regulation in France and around the world. The AOC system presumes that the land from which the grapes are grown imparts a unique quality that is specific to that growing site (the plants' habitat). The extent of terroir's significance is debated in the wine industry. Over the centuries, French winemakers developed the concept of terroir by observing the differences in wines from different regions, vineyards, or even different sections of the same vineyard. The French began[when?] to crystallize the concept of terroir as a way of describing the unique aspects of a place that influence and shape the wine made from it. Long before the French, the wine-making regions of the ancient world had already developed a concept of different regions having the potential to produce very different and distinct wines, even from the same grapes. The Ancient Greeks would stamp amphorae with the seal of the region they came from, and soon[when?] different regions established reputations based on the quality of their wines. 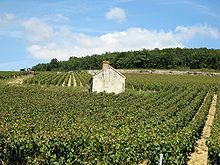 For centuries, literate and disciplined members of the Benedictine and Cistercian orders cultivated grapes in much of Burgundy. With vast landholdings, the monks could conduct large-scale observation of the influences that various parcels of land had on the wine it produced. Some legends have the monks going as far as "tasting" the soil. Over time the monks compiled their observations and began to establish the boundaries of different terroirs - many of which still exist today as the Grand Cru vineyards of Burgundy. While the concept of terroir is not specific to Burgundy, the examples of Burgundy wine from places like the Chablis premier cru Fourchaume are very terroir driven. The interaction of climate and terroir is generally broken down from the macroclimate of a larger area (For example, the Côte de Nuits region of Burgundy), down to the mesoclimate of a smaller subsection of that region (such as the village of Vosne-Romanée) and even to the individual microclimate of a particular vineyard or row of grapevines (like the Grand Cru vineyard of La Grande Rue). The element of soil relates both to the composition and the intrinsic nature of the vineyard soils, such as fertility, drainage and ability to retain heat. Geomorphology refers to natural landscape features like mountains, valleys and bodies of water, which affect how the climate interacts with the region, and includes the elements of aspect and elevation of the vineyard location. Other organisms growing in, on, and around the vine plots refers to the region specific fauna, flora, and microflora present in the vineyards. The microbial populations in vineyards have been described as being a quantifiable aspect of the overall terroir. The definition of terroir can be expanded to include elements that are controlled or influenced by humans. This can include the decision of which grape variety to plant, though whether or not that grape variety will produce quality wine is an innate element of terroir that may be beyond human influence. Some grape varieties thrive better in certain areas than in others. The winemaking decision of using wild or ambient yeast in fermentation instead of cultured or laboratory produced yeast can be a reflection of terroir. The use of oak is a controversial element since some will advocate that its use is beneficial in bringing out the natural terroir characteristics while others will argue that its use can mask the influences of the terroir. Vineyard management (e.g. growing grapes organically or biodynamically over a more conventional method of farming) can also be seen as a human controlled aspect of terroir. Many decisions during the growing and winemaking process can either lessen or increase the expression of terroir in the wine. These include decisions about pruning, irrigation and selecting time of harvest. At the winery, the use of oak, cultured or ambient yeast, length of maceration and time in contact with lees, temperature during fermentation, and processes like micro-oxygenation, chaptalization, clarification with fining agents, and reverse osmosis all have the potential to either reduce or emphasize some aspect derived from the terroir. Winemakers can work between the extremes of producing wine that is terroir-driven and focused on purely expressing the unique aspects of a region's terroir, or winemaking that is done without any consideration given to terroir. Furthermore, aspects of terroir such as climate and soil type may be considered when deciding such things as which grape variety to plant if the goal is to make good wine rather than terroir-driven wine. The importance of these influences depends on the culture of a particular wine region. In France, particularly Burgundy, there is the belief that the role of a winemaker is to bring out the expression of a wine's terroir. The French word for "winemaker," vigneron, is more aptly translated as "wine-grower" rather than "winemaker". The belief that the terroir is the dominant influence in the wine is the basis behind French wine labels emphasizing the region, vineyard, or AOC more prominently than the varietal of grape, and often more prominently than the producer. The concept of terroir exists in other drinks, notably in tea and Cognac where the chalky soil, climate and distance from the ocean are all factors influencing the product. As of 2018, producers of whiskey, bourbon, rum, and vodka used terroir elements in their production process, including wood flavors derived from barrel aging. The tenet of terroir has also been applied to the production of Artisan cheese, and French authorities have fought to balance traditional cheesemakers terroir cheeses concerns with those of major industrialists. The influence of terroir means that wines from a particular region are unique, incapable of being reproduced outside that area, even if the grape variety and winemaking techniques are painstakingly duplicated. Winemakers in Burgundy do not believe that they are producing Pinot noir that happens to be grown in Burgundy, but that they are producing unique Burgundian wines that happen to be made from Pinot noir. Appellation systems, such as the French AOC systems, have developed around the concepts of "unique wines from a unique area". These systems have also developed into protected designation of origin across the European Union so that, for example, winemakers from outside a region like Tuscany can not produce a Sangiovese wine and call it a Chianti. While the wine may be made from the same clonal variety of Sangiovese, in the same soil composition as found in the Chianti region with winemakers using the Tuscan method of production, there is an assumption that the two wines will be different due to terroir. The names of these European wine regions are protected so that wines from different regions and different terroir are not confused with wines from that those regions – i.e. A Spanish or Australian "chianti". In the United States there is some confusion over the use of semi-generic names like Champagne and Port but there has been more effort by the American wine industry to recognize the unique association of place names with the wines produced in those places, such as the 2005 Napa Declaration on Place agreement. While appellation systems and the protected designations of origin can be a way of protecting "unique terroir", the commercial importance of terroir has been a much debated topic in the wine industry. In Spain in 2018, networks of vintners joined in a grassroots movement to produce wines with added terroir value with intention to enhance the Spanish rural wine culture. The importance of terroir affects the price of the agricultural product as well as the products made from the product. Branding, variety, and farmer identification affects the price of a product. The Slow Food movement appreciates history of a variety of plant or animal, the story of the farmer who produced it, and ultimately the quality of the product. Chefs and bakers develop their own list of qualities they desire for their creations, and terroir affects these. Wine critics question the value of a Pinot noir wine from a Burgundy Grand Cru vineyard relative to a wine produced from the "lesser terroir" of a Premier Cru vineyard, and whether it merits the higher price. These doubts also arise when the quality of winemaking and other human influences are taken into account, which may be of a higher standard with the "lesser" premier cru. These critics also question the difference between New World and Old World wine and whether modern winemaking techniques – like significant oak influences, over-ripened fruit, cultured yeast, micro-oxygenation, and color pigment additives – obscure or even eliminate the influence of terroir in making different regions unique. Critics often point to the homogenizing effect on mass-produced wines made from popular varietals like Chardonnay, which may have their terroir characteristics hidden by invasive and intensive winemaking. A heavily oaked, over-ripe Chardonnay from California can taste very similar to the same style of wine from elsewhere. The marketability of wines from different regions and producers is affected by the importance accorded to terroir, both by the wine industry and consumer wine markets, with some producers downplaying terroir and its effect on their wines. In the United States, the principles of terroir have been applied in a few limited instances, such as Vidalia onions, whose production area has been defined by the United States Department of Agriculture an Indian River fruit, which can only carry that label if grown within an area defined by the United States Federal Trade Commission. In some Asian countries, terms like terroir or marriage have been popularised in Japanese manga. A 2008–09 Korean drama, most of whose leading characters work with wine, is titled Terroir after the main setting, a wine restaurant in turn named for the concept. The concept of terroir has been discussed in several films and television shows. Jonathan Nossiter's 2004 documentary, Mondovino, explores the globalization of the wine business, and features interviews with a number of small producers, mostly French, who talk about terroir. In the 2006 BBC series, Oz and James's Big Wine Adventure, one episode is almost entirely devoted to Oz Clarke teaching James May about terroir. At the end of the episode, May identifies three wines successfully, placing them in the correct order on the basis of the quality of terroir they come from. Les Blank and Gina Leibrecht's 2007 documentary, All In This Tea, explores the importance of terroir and organic growing methods for the quality and future sustainability of the Chinese tea market. Terroir is also a frequent topic of discussion in the Japanese wine comic Les Gouttes de Dieu. The films French Kiss and A Good Year also make references to terroir. Terroir recognition is a plot turning point in the 1976 French comedy L'aile ou la cuisse (The Wing or the Thigh) with Louis de Funès. In 2014 Keith Carradine starred in John Charles Jopson's Edgar Allan Poe inspired film 'Terroir'. In Jeff VanderMeer's Southern Reach Trilogy, the character Whitby uses the concept of terroir to describe the traits and effects of the mysterious environmental anomaly at the center of the narrative. ^ Tanzer, Stephen. "What is terroir?". Stephen Tanzer's Winophilia. Archived from the original on 24 July 2015. Retrieved 23 July 2015. ^ MacNeil, Karen (2015-10-13). "Burgundy". The Wine Bible (2, revised ed.). New York: Workman Publishing Company (published 2015). p. 199. ISBN 9780761187158. Retrieved 2016-06-29. [...] the period most crucial in the region's history was the thousand-year period from the eighth century to the French Revolution, when much of the land and most of its wines were under the powerful command of Benedictine and Cistercian monks. [...] Contemplative by nature, patient in temperament, systematic in approach, committed to grueling physical labor, well bestowed with land, and, most important, literate, the monks were uniquely prepared for their mission: to delineate and codify Burgundy's vineyards. Plot by plot, they cleared and cultivated the most difficult limestone slopes of the Côte d'Or, studiously comparing vineyards and the wines made from them, recording their impressions over centuries. Tantamount to a millennium-long research project, the work of these monks [...] in fact, for the first time, established terroir as the critical core of viticulture. ^ Fraga, Helder; Malheiro, Aureliano C; Moutinho-Pereira, José; Cardoso, Rita M; Soares, Pedro M. M; Cancela, Javier J; Pinto, Joaquim G; Santos, João A (2014). "Integrated Analysis of Climate, Soil, Topography and Vegetative Growth in Iberian Viticultural Regions". PLOS ONE. 9 (9): e108078. Bibcode:2014PLoSO...9j8078F. doi:10.1371/journal.pone.0108078. PMC 4176712. PMID 25251495. ^ Bokulich, N. A; Thorngate, J. H; Richardson, P. M; Mills, D. A (2013). "PNAS Plus: Microbial biogeography of wine grapes is conditioned by cultivar, vintage, and climate". Proceedings of the National Academy of Sciences. 111 (1): E139–48. Bibcode:2014PNAS..111E.139B. doi:10.1073/pnas.1317377110. PMC 3890796. PMID 24277822. ^ Knight, Sarah; Goddard, Matthew R (2014). "Quantifying separation and similarity in a Saccharomyces cerevisiae metapopulation". The ISME Journal. 9 (2): 361–70. doi:10.1038/ismej.2014.132. PMC 4303630. PMID 25062126. ^ Van Leeuwen, C (2010). "Terroir: The effect of the physical environment on vine growth, grape ripening and wine sensory attributes". Managing Wine Quality. pp. 273–315. doi:10.1533/9781845699284.3.273. ISBN 9781845694845. ^ Clay Risen (21 August 2018). "Can Liquor Have a Local Taste? They're Banking on It". The New York Times. Retrieved 23 February 2019. ^ Erlanger, Steven (2013-08-31). "Vive le Terroir". New York Times. Retrieved 2013-10-18. ^ Monaco, Emily. "The end to a French cheese tradition?". bbc.com. ^ Alonso González, Pablo; Parga Dans, Eva (2018). "The 'terroirist' social movement: The reawakening of wine culture in Spain". Journal of Rural Studies. 61: 184–196. doi:10.1016/j.jrurstud.2018.04.014. ^ "7 CFR Part 955 - VIDALIA ONIONS GROWN IN GEORGIA". LII / Legal Information Institute. ^ "History – Indian River Citrus League". ircitrusleague.org. Thomas Parker "Tasting French Terroir: The History of an Idea" University of California Press 2015 ISBN 978-0520277519. Thomas J. Rice, Ph.D. and Tracy G. Cervellone, C.W.E. "Paso Robles: An American Terroir" Published by the authors. 2007. ISBN 978-0-9799406-1-3. Zachary Nowak "Against Terroir" in Petites Propos Culinaires 96, June 2012, pp. 92–108.